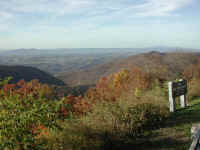 (Blue Ridge Mountains in Virginia 3 Nov 2005 - 01) We took this westward looking photo from an overlook on the Blue Ridge Parkway near Amherst. 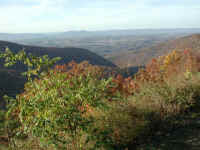 (Blue Ridge Mountains in Virginia 3 Nov 2005 - 02) This is another westward looking view from the overlook. 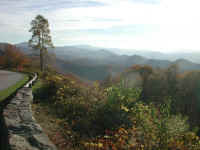 (Blue Ridge Mountains in Virginia 3 Nov 2005 - 03) This is another one of our westward looking views from the Blue Ridge Parkway. 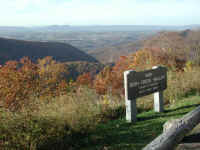 (Blue Ridge Mountains in Virginia 3 Nov 2005 - 04) As the sign at the overlook indicates, we are looking down upon Irish Creek Valley. 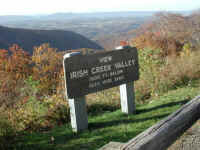 (Blue Ridge Mountains in Virginia 3 Nov 2005 - 05) This is a closer look at the Irish Creek Valley sign with the valley below. 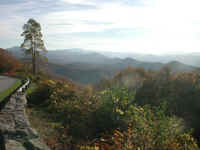 (Blue Ridge Mountains in Virginia 3 Nov 2005 - 06) In this photo, we are looking in a southwesterly direction along the Blue Ridge Mountains. 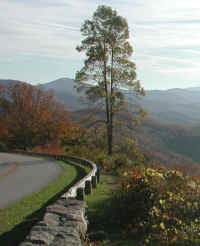 (Blue Ridge Mountains in Virginia 3 Nov 2005 - 06a) This is a closer look at some of the scenery and the well maintained Blue Ridge Parkway. 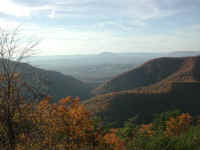 (Blue Ridge Mountains in Virginia 3 Nov 2005 - 07) This is another look at the Blue Ridge Mountains.